Two rookies turfed from Tory cabinet. New Tourism Minister Richard Starke, and departing cabinet ministers Stephen Khan and Christine Cusanelli. 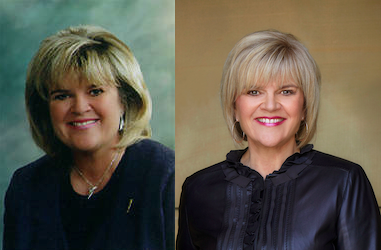 In an unexpected move, Premier Alison Redford shuffled two rookie cabinet ministers out of her cabinet yesterday morning. Advanced Education & Enterprise Minister Stephen Khan (MLA St. Albert) and Tourism Minister Christine Cusanelli (MLA Calgary-Currie) were both appointed to cabinet in May 2012. Mr. Khan’s time in cabinet was largely seen as reserved and underwhelming. Ms. Cusanelli caused an unwelcome stir when she was forced to repay the government $10,600 for expenses made in her first five months in office, including $4,000 in airfare to have her daughter and mother join her at the 2012 Summer Olympics in London, United Kingdom. She was also given the unenviable task of defending the government’s large line of hospitality expenses at the London Games. Ms. Cusanelli’s ministerial office was recently shuffled with the hiring of Chief of Staff Tammy Forbes, who previously served as the Premier’s media liaison, and press secretary Andrew Fisher, who previously served as Chief of Staff. 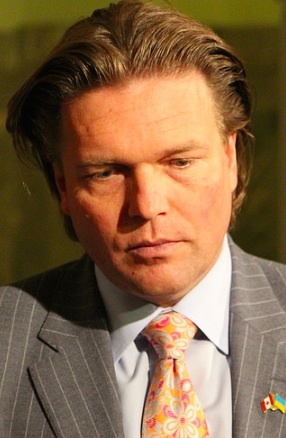 Replacing Mr. Khan is Deputy Premier Thomas Lukaszuk, who has been operating without an official cabinet portfolio since before last year’s election. First-term MLA Richard Starke, representing Vermilion-Lloydminster, has been tapped to replace Ms. Cusanelli as Minister of Tourism. Minister Starke’s constituency has a long history of electing MLAs who later served as cabinet ministers. First to the Tory cabinet was Lloydminster MLA Bud Miller served as the Minister of Public Lands and Wildlife in Premier Peter Lougheed‘s cabinet from 1979 to 1982. 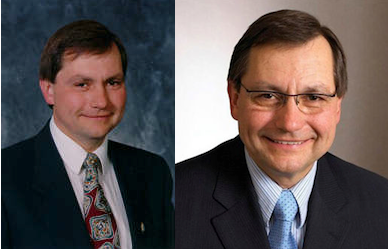 Directly preceding Minister Starke was Lloyd Snelgrove, who was MLA from 2001 to 2012 and served in a number of portfolios during Premier Ed Stelmach‘s time in office, including a period of Minister of Finance. Citing irreconcilable differences, Mr. Snelgrove left the PC caucus to sit as an Independent MLA following Premier Redford’s successful leadership bid. 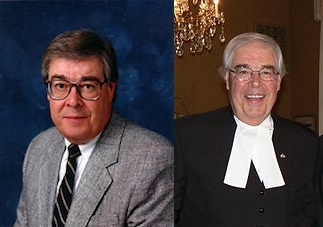 Preceding Mr. Snelgrove was Steve West, who served as the constituency’s MLA from 1986 to 2001 and served in a number of cabinet portfolios during Premier Ralph Klein‘s time in office, including Minister of Finance. (Judging from historical trends, you might think there is a good chance that Minister Starke could one day be Minister of Finance). This entry was posted in Alberta Politics and tagged Alison Redford, Andrew Fisher, Bud Miller, Christine Cusanelli, Ed Stelmach, Lloyd Snelgrove, Peter Lougheed, Ralph Klein, Richard Starke, Stephen Khan, Steve West, Tammy Forbes, Thomas Lukaszuk on February 5, 2013 by Dave Cournoyer. the great alberta election pool. Who will run the show after April 23? On Monday, Albertans will go to the polls in what is already being dubbed a “historic” election. 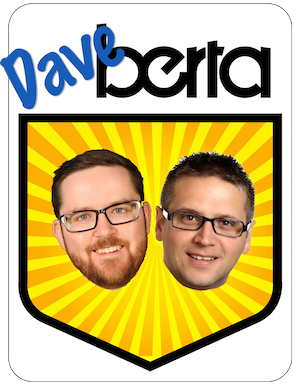 The outcome is uncertain, so why not gaze into your crystal ball and enter the Daveberta and CalgaryGrit election pool. It is simple enough – predict the seat totals for each party and answer 10 bonus questions. Everyone gets 87 points minus one point for each seat you are off per party, plus two points per correct bonus question. First choice goes to the overall winner, with the winners of the seat prediction portion and the bonus question portion also winning a book pack. So even if you are an Ontarian, like my friend Dan, with no clue what a “Ted Morton” is, never mind if he’ll win his seat, you can skip the bonus questions and still be eligible for the prizes, based on a shot-in-dark seat prediction. Contest will close as soon as the polls open Monday. Please paste your entry in the comments here or at CalgaryGrit, or e-mail your picks in to david.cournoyer@gmail.com. 6. 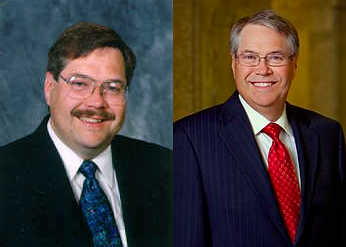 Will either Allan Hunsperger (“gays burn in hell”) or Ron Leech (“being white is an advantage”) win their seat? 10. Who will get more votes – Liberals or NDP? This entry was posted in Alberta Politics and tagged Alison Redford, Allan Hunsperger, Arno Doerksen, Brian Mason, Bruce Miller, Danielle Smith, Don Koziak, Doug Griffiths, Ed Stelmach, Genia Leskiw, Glenn Taylor, Heather Klimchuk, Lloyd Snelgrove, Raj Sherman, Ray Danyluk, Ray Martin, Robert Vollman, Ron Leech, Sue Huff, Ted Morton on April 19, 2012 by Dave Cournoyer. 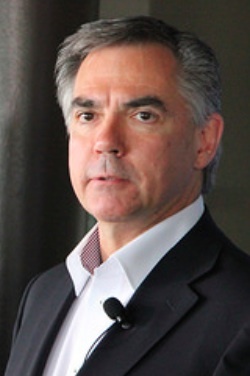 alberta politics: stormy waters ahead. A Sun News Network commissioned poll looks good for the Wildrose Party and bad for the Progressive Conservatives. 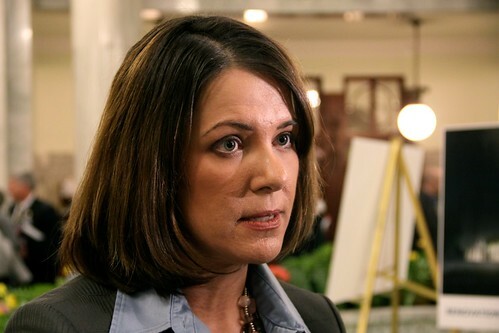 Global leaders were shocked yesterday when a new poll commissioned by QMI-Sun News Media showed Danielle Smith‘s Wildrose Party has made significant headwaters against the governing Progressive Conservatives. There are serious questions being raised about the results of this poll, which make me question the results. For example, the regional breakdown of party support includes only 81 respondents surveyed from southern Alberta, which results in an unreliably high 11% margin of error (via @calgarygrit). The optimistic results for the Wildrose Party, which already receives daily enthusiastic editorial support from right-wing Sun media, leads me to take with a grain of salt any political polling produced by this media network. Most legitimate polls, including those conduced by Leger Marketing and Environics, have shown the Tories with 45%-55% support province-wide and the three main opposition parties – Wildrose, NDP, and Liberals – grouped together in the mid-teens. A number of recent polls, including one conducted by Return on Insight, have produced results suggesting that the Wildrose Party has begun to break from the pack of opposition parties, which is not unbelievable at this point. Update: Dan Arnold and David Climenhaga have shared their views on these polls. Recent heavy-handed actions by Premier Alison Redford suggest that the establishment of the 41-year governing party is beginning to worry about their electoral fortunes. The release of negative radio ads (which were tame in my mind) suggests that the Tories are feeling pressure to hit back at harsh criticism by the Wildrose Party about new laws limiting blood alcohol levels to 0.05%. Suspending all Legislative and Government committee pay for PC MLAs was a reaction to wide-spread criticism of an absent committee. The drastic move may also have been a shot across the bow of unhappy PC backbench MLAs and former cabinet ministers, who some insiders say have been sowing discontent towards their party’s new direction. The departure of former Finance Minister Lloyd Snelgrove, who now sits as an Independent MLA and will not be seeking re-election, is one example of the tensions between Premier Redford and loyalists of the former Premier. It is not difficult to imagine some Tories expressing discomfort with Premier Redford’s move to discipline her former leadership competitor Gary Mar. The majority of the current PC MLAs supported Mr. Mar’s leadership bid in 2011. The PCs are deliberately focusing their attacks on their largest perceived threat, the Wildrose Party, ignoring the current official opposition Liberals. 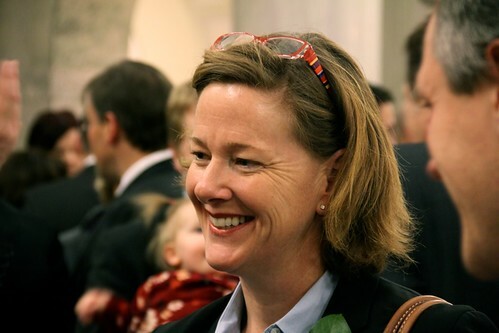 Premier Redford’s appeal to political moderates has led to more than a few prominent Liberal supporters migrating to the PC Party, including two-term Lethbridge-East MLA Bridget Pastoor who crossed the floor to the PCs in November 2011. As Alberta’s dominant big tent political party, the Tories will naturally benefit from neutralizing any potential centrist opposition while trying to push the other opposition parties to the ideological fringes. Email inboxes across the province yesterday were treated a to the “bing” signalling a new PC Party online newsletter touting Premier Redford’s fulfilled promise to hold a “Full judicial inquiry into queue jumping.” Of course, the decision to allow the Health Quality Council of Alberta (HQCA), led by a retired judge, to investigate allegations of queue jumping is a pretty loose interpretation of an actual “Full judicial inquiry”. Created in 2002 as a result of the Report of the Premier’s Advisory Council on Health, the mandate of the HQCA is to “promote patient safety and health service quality.” Of course, resistance by politicians to holding a real judicial inquiry is not surprising. Real judicial inquiries are uncontrollable and politically dangerous, just ask former Prime Minister Paul Martin how his judicial inquiry worked out for him. This entry was posted in Alberta Politics and tagged Alison Redford, Bridget Pastoor, Dan Arnold, Danielle Smith, David Climenhaga, Gary Mar, Lloyd Snelgrove, Paul Martin on March 14, 2012 by Dave Cournoyer. ken kowalski chooses retirement over death in office. 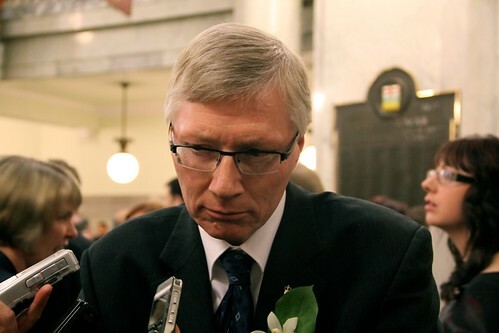 He once told Albertans that he would “die in office” rather than retire and collect his gold plated severance package, but this week Speaker Ken Kowalski opted for retirement instead of the afterlife. The long-time MLA announced yesterday in a letter to the Progressive Conservative Party that he would not be seeking re-election in the Spring 2012 provincial election. He was in August 2011. 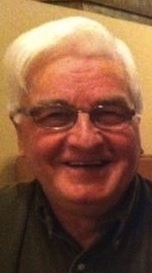 Speaker Kowalski is the longest serving MLA in the Assembly and was first elected in a 1979 by-election in the Barrhead constituency. His absence will undoubtably lead to a hotly contested PC nomination in Barrhead-Morinville-Westlock. 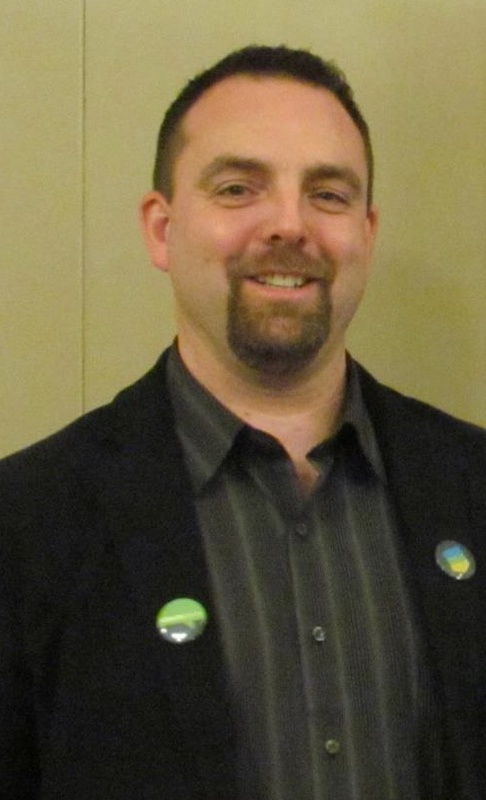 Hoping to capture the seat from the Tories is Wildrose candidate and former Alberta Report publisher Link Byfield, who has been on the hustings for more than a year. Upon his retirement, Speaker Kowalski is expected to collect $1,271,600 in transition allowance, and it is suspected that he may also collect $54,000 per year from the now-defunct MLA pension that was dissolved in 1992. His retirement announcement takes place before a review of MLA salaries and benefits, led by retired Justice John Major, can take place. 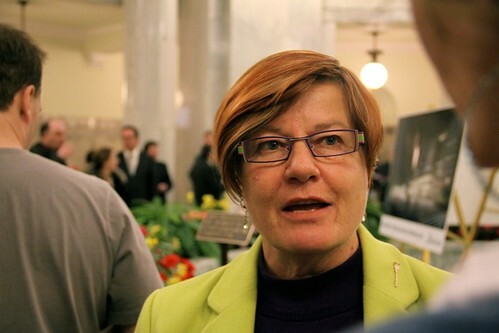 This MLA pay review initiated by Premier Alison Redford may succeed in forcing generational change in the PC caucus by prompting the retirement of a number of stodgy former Tory cabinet ministers, including Sherwood Park MLA Iris Evans, Grande Prairie-Smoky MLA Mel Knight, Vermilion-Lloydminster MLA Lloyd Snelgrove, Banff-Cochrance MLA Janis Tarchuk, and current Finance Minister and Calgary-West MLA Ron Liepert. This entry was posted in Alberta Politics and tagged Alison Redford, Iris Evans, Janis Tarchuk, John Major, Ken Kowalski, Link Byfield, Lloyd Snelgrove, Mel Knight, Ron Liepert on December 10, 2011 by Dave Cournoyer. 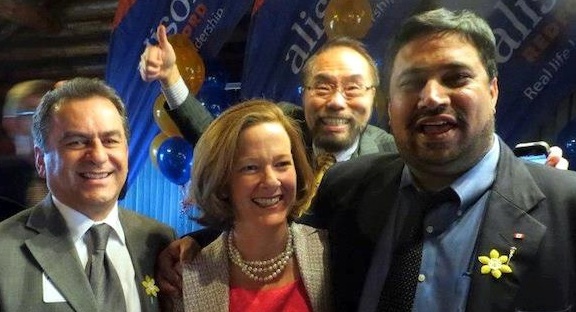 alison redford appoints gary mar’s cabinet. Tory MLAs gather for the traditional game musical chairs to choose the new Cabinet. 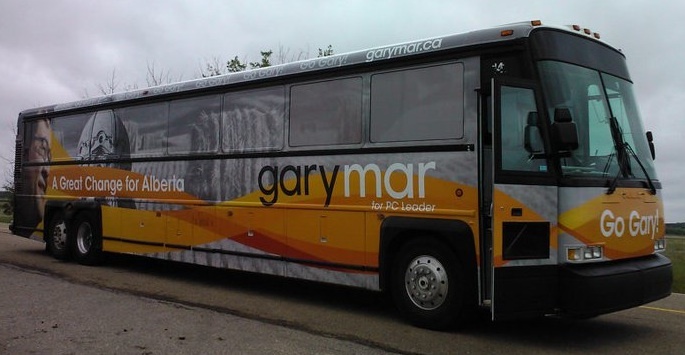 Do you think Gary Mar left a draft cabinet list in the Premier’s Office when he was measuring the drapes? Because Premier Alison Redford found it. We were told to expect big changes, that many “household names” would be dropped from cabinet, but as they enter their new jobs, Premier Alison Redford‘s cabinet looks like one that should have been made by her main leadership opponent Gary Mar. Edmonton-Rutherford MLA Fred Horne‘s appointment as Minister of Health and Wellness and Ron Liepert‘s appointment as Finance Minister means that there will be no serious judicial inquiry into the intimidation of health care workers. Minister Liepert’s promotion from Energy to Finance is surprising considering that only last week he was openly defying Premier Redford on the need for a health care inquiry. Both Mr. Horne and Mr. Liepert were strong supporters of Mr. Mar in the leadership contest and would have likely ended up in similar positions had he not been defeated on the third ballot vote on October 1. It has yet to be seen what new powers Minister Liepert will hold as Finance Minister. Remember that in recent cabinets, the President of the Treasury Board has held considerable sway over the province’s purse-strings. This could mean that ‘Liepert the Hound‘ could turn into ‘Liepert the Pup‘ when dealing with the current Treasury Board President and Deputy Premier Doug Horner. A map of the constituencies represented by members of Alberta's new cabinet. 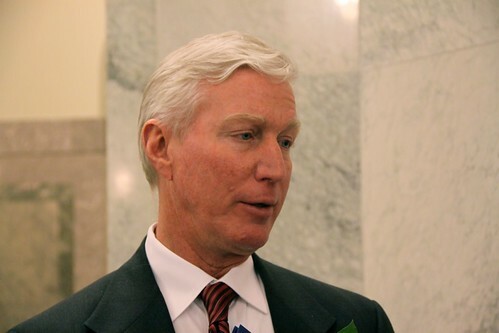 Former Finance Minister Ted Morton is moving into the Energy Minister’s office, an area where he will be comfortable defending the province’s record on oil sands development. 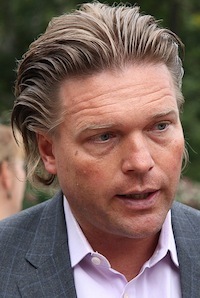 New Education Minister Thomas Lukaszuk is a cabinet lightweight who will have to be a quick study if he wants to survive in his new job. He and Premier Redford started things off right this afternoon with the announcement adding $100 million into the education budget today. Both Minister Morton and Minister Lukaszuk supported Mr. Mar on the final ballot of the PC leadership contest. 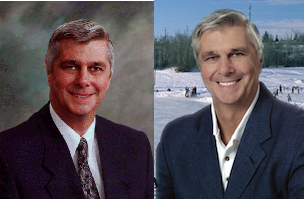 The appointment of Battle River-Wainwright MLA Doug Griffiths as Minister of Municipal Affairs could turn out to be an interesting choice. Minister Griffiths, who was defeated on the first ballot of the PC leadership contest and has never served in cabinet, comes with both inexperience and an open-mind. Despite his rural pedigree, I would not discount his ability to build relationships with the group of young municipal leaders who have been elected in recent years, including Calgary Mayor Naheed Nenshi and Edmonton City Councillor Don Iveson. The appointment of Edmonton-Whitemud MLA and long-time cabinet minister Dave Hancock (also a Mar loyalist) as Minister of the new Human Services super-ministry is a smart choice. Minister Hancock is a seasoned govern0r who may be the only MLA who can help weave and organize this newly formed portfolio, which includes Children and Youth Services, Employment and Immigration (except for immigration), Homelessness, Alberta Supports (from Seniors and Community Supports). Rewarded for his most (if only) significant political decision is backbench MLA Art Johnston, who was appointed Parliamentary Assistant to Executive Council (which means he gets to carry Premier Redford’s briefing binder in the Assembly). 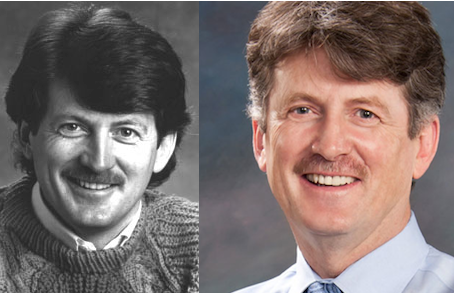 Mr. Johnston was the only MLA to support Ms. Redford on the first ballot of the PC leadership vote. Some much needed new blood around the cabinet table includes Drayton Valley-Calmar MLA Diana McQueen as Minister of Environment and Water, Calgary-Montrose MLA Manmeet Bhullar as Minister of Service Alberta, Athabasca-Redwater MLA Jeff Johnson as Minister of Infrastructure, and Red Deer-South MLA Cal Dallas as Minister of International, Intergovernmental and Aboriginal Relations. Notable cabinet ministers joining the great unwashed masses in the Tory backbenches include Sherwood Park MLA Iris Evans, Vermilion-Lloydminster MLA Lloyd Snelgrove, Innisfail-Sylvan Lake MLA Luke Ouellette, Edmonton-Mill Creek MLA Gene Zwozdesky, Calgary-Cross MLA Yvonne Fritz, Calgary-Shaw MLA Cindy Ady, and Medicine Hat MLA Rob Renner. It would not be surprising to see these now backbench MLAs and others decide to collect their million dollar severance packages and not stand in the next election. Not to be unexpected, it did not take long for the rumour mill to start suggesting what next steps these former cabinet ministers might take. 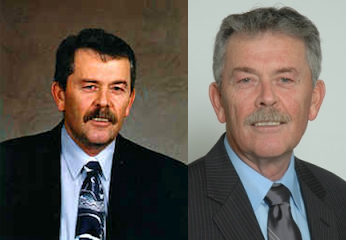 If he is not retiring, one rumour I heard today suggests that Mr. Zwozdesky may seek re-election and challenge Speaker Ken Kowalski for his position in the Assembly after the next election. 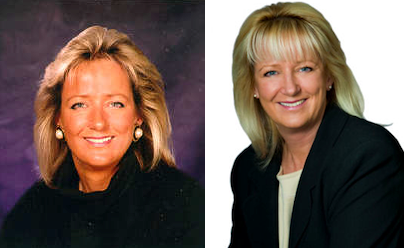 Avoiding one of former Premier Ed Stelmach‘s first mistakes, this cabinet reaches a respectable geographical balance. Four cabinet minister each from Calgary and Edmonton and the remaining twelve spread across the province. This entry was posted in Alberta Politics and tagged Alison Redford, Art Johnston, Cal Dallas, Cindy Ady, Dave Hancock, Diana McQueen, Don Iveson, Doug Griffiths, Doug Horner, Ed Stelmach, Fred Horne, Gary Mar, Gene Zwozdesky, Iris Evans, Jeff Johnson, Ken Kowalski, Lloyd Snelgrove, Luke Ouellette, Manmeet Bhullar, Naheed Nenshi, Rob Renner, Ron Liepert, Ted Morton, Yvonne Fritz on October 12, 2011 by Dave Cournoyer. alison redford’s first cabinet – who’s in? who’s out? 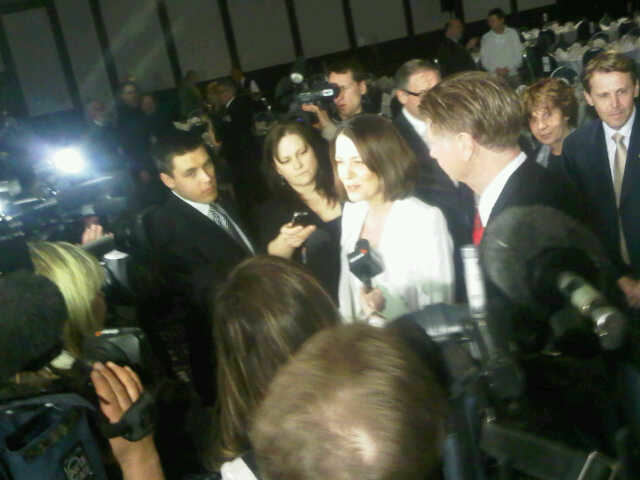 Premier Alison Redford will announce the appointment of her first cabinet at 10:00am this morning. I presented my list of predictions last week and since then we have some stronger indication of who will be appointed today and who will be joining the backbenchers this morning. We have been told to expect a significant shuffle and a smaller number of cabinet ministers. 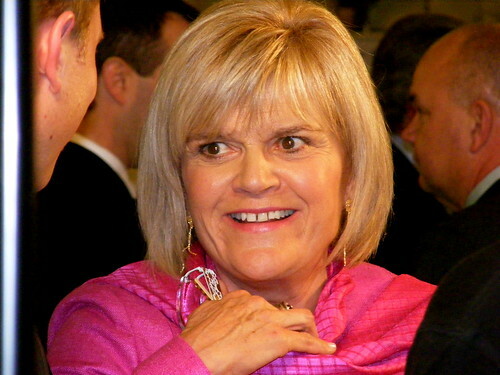 Iris Evans (Sherwood Park) – Long-time cabinet minister under Premiers Ralph Klein and Ed Stelmach. 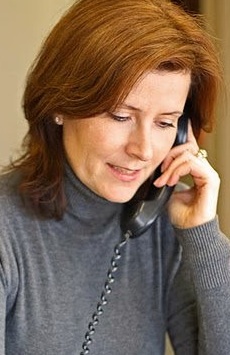 Her staff was seen cleaning our her office this week, according to CBC reporter Kim Trynacity. Ron Liepert (Calgary-West) – Apt at picking the wrong horse in his party’s leadership contests, Mr. Liepert was the strong-arm for Jim Dinning in 2006 and Gary Mar in 2011. Lloyd Snelgrove (Vermilion-Lloydminster) – The last Finance Minister of Premier Stelmach’s administration supported Mr. Mar in the leadership contest and told the Meridian-Booster that he would decline an appointment in Premier Redford’s cabinet. This entry was posted in Alberta Politics and tagged Alison Redford, Iris Evans, Kim Trynacity, Lloyd Snelgrove, Ron Liepert on October 12, 2011 by Dave Cournoyer. a first ballot victory for gary mar? First ballot voting for Alberta’s Progressive Conservative leadership does not take place until September 17, but a show of force has led some politicos to begin speculating that former cabinet minister Gary Mar could be steamrolling towards a first ballot victory against his five opponents. With a flashy campaign launch, a deep war-chest, and a strong showing of support at a fundraiser attended by around 1500 supporters in Edmonton, it may not be far fetched speculation. Attracting the endorsements of the PC Party establishment, including cabinet minister Iris Evans, Ron Liepert, Mel Knight, Lloyd Snelgrove, and Thomas Lukazsuk, as well as growing bevy of MLAs including Ray Prins and George Rogers. According to the newsletter Insight into Government, long-time Calgary Liberal fundraiser Daryl Fridhandler is supporting Mr. Mar’s candidacy. Questions that were initially raised about his connections to mismanagement while Health & Wellness Minister in the late 1990s have been swept aside by Mr. Mar’s General Election-style campaign. Even the Alberta Medical Association, which has spent a considerable amount of time in the past cozying up to the Progressive Conservatives (perhaps with questionable results for its members) is promoting Mr. Mar. His main opponents will do their best to stop Mr. Mar from rolling to a first-ballot victory. Right-wing standard bearer and former Finance Minister Ted Morton has attracted the support of Housing Minister Jonathan Denis and MLAs George Groenveld and Dave Rodney. While his campaign should not be underestimated, Mr. Morton is either on vacation or campaigning in a stealth plane. He has barely made news headlines since a highly-public row with Premier Ed Stelmach over the provincial budget led to his resignation earlier this year. Former Deputy Premier Doug Horner is criss-crossing the province, and as the only candidate from northern Alberta (and the Edmonton region), he is likely to draw considerable regional support that Mr. Mar may find difficult to tap into. The endorsement of Lac La Biche-St. Paul MLA Ray Danyluk and more expected MLA endorsements may position Mr. Horner as the de-facto “northern opposition” to the Calgary-based Mr. Mar. Rick Orman, a Calgary oil-man and former cabinet minister who left politics in 1993, is said to be well-funded and eating away at Mr. Morton’s support. For all his good intentions, Battle River-Wainwright MLA Doug Griffiths is said to be struggling financially, which must be disappointing for the young MLAs enthusiastic supporters, which include Calgary-North Hill MLA Kyle Fawcett. Former Justice Minister Alison Redford may be the biggest obstacle standing between Mr. Mar’s and a first-ballot victory on September 17. 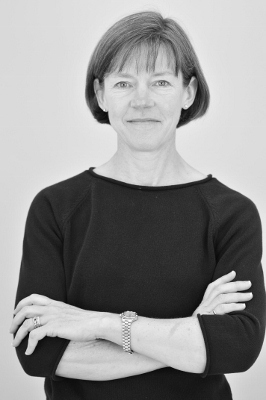 A fellow Calgarian with considerable financial support and an aggressive campaign to distance herself from the unpopular administration of Premier Stelmach, Ms. Redford may challenge Mr. Mar for the support of moderates in the PC Party. Challenging Mr. Mar for the votes of these moderate PC members could deny him the base he needs to mount an early victory. This entry was posted in Alberta Politics and tagged Alison Redford, Daryl Fridhandler, Doug Griffiths, Doug Horner, Gary Mar, George Rogers, Iris Evans, Kyle Fawcett, Lloyd Snelgrove, Mel Knight, Ray Danyluk, Ray Prins, Rick Orman, Ron Liepert, Ted Morton, Thomas Lukaszuk on July 2, 2011 by Dave Cournoyer. 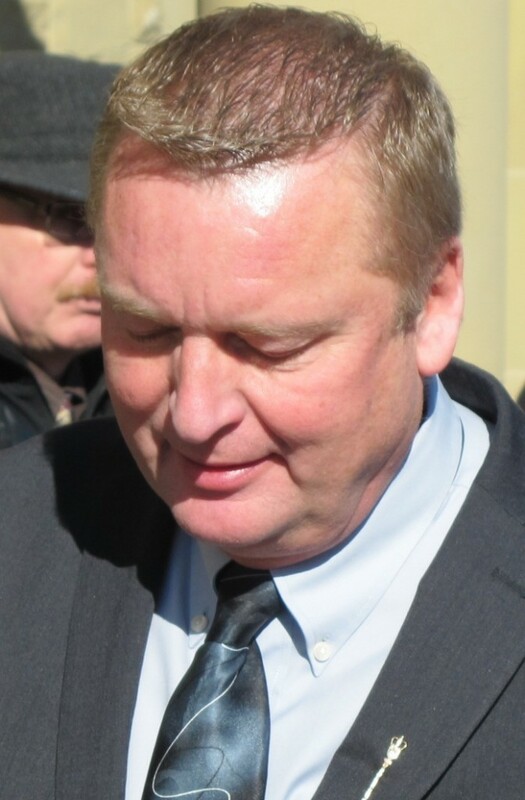 lyle oberg’s wildrose jump: connecting the dots. Danielle Smith and Lyle Oberg at last night's Wildrose fundraising dinner in Edmonton. Photo via @wmcbeath. Twelve years after he fired Trustee Danielle Smith by dissolving the Calgary Board of Education, former PC cabinet minister Lyle Oberg announced yesterday that he was joining the Wildrose Alliance and would be introducing Ms. Smith at her party’s fundraising dinner last night in Edmonton. Attracting a high-profile Tory like Mr. Oberg is a public relations coup for the Wildrose, but it is not impossible to connect the dots that led to his decision. 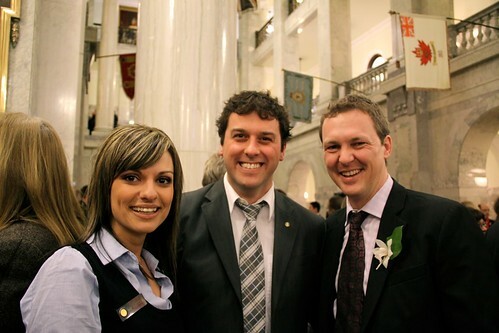 Mr. Oberg’s wife, Evelyn, works for Fort McMurray-Wood Buffalo Wildrose MLA Guy Boutilier and, in 2006, Mr. Boutilier was one of two PC MLAs who supported Mr. Oberg in his failed PC leadership bid (the other was Lesser Slave Lake PC MLA Pearl Calahasen). 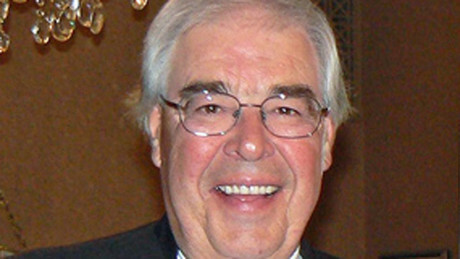 Mr. Oberg served as Minister of various portfolios while Ralph Klein was Premier and was Finance Minister in Premier Ed Stelmach‘s first government from 2006 to 2008. After discovering that the real financial power rested not with the Finance Minister, but with Treasury Board President Lloyd Snelgrove, Mr. Oberg went out of his way to publicly contradict the Premier’s message on energy royalty review and a national securities regulator before announcing that he would not seek re-election in 2008. Another former PC cabinet minister, Doug Main, was the Master of Ceremonies for last night’s fundraiser. I thought that Premier Stelmach’s resignation announcement would have stemmed the flow of high-profile former PCs joining the Wildrose. I wonder who could be next? This entry was posted in Alberta Politics and tagged Danielle Smith, Doug Main, Ed Stelmach, Evelyn Oberg, Lloyd Snelgrove, Lyle Oberg, Pearl Calahasen, Ralph Klein on March 3, 2011 by Dave Cournoyer. legislative agenda a side-show. leadership contests the only show in town. Amid all the regal pomp and ceremony we could spare ahead of Wills & Kate’s expected visit this Summer, Lieutenant Governor Donald Ethell delivered his first Speech from the Throne today. An annual event, politicos patiently lined up to listen to the Queen’s representative sit on a throne and read a speech (and then afterward network at a giant cocktail party under the Rotunda’s giant marble dome). Typically, these speeches are used to present vague feel-good messages about the government’s legislative agenda during that session of the Assembly. With Premier Ed Stelmach having announced that he will resign in September 2011, there is little doubt that most of the real political action overt the next eight months will take place outside the Assembly. As the experience in the provincial cabinet was parred down with the departure of leadership candidates Ted Morton, Doug Horner, and Alison Redford, this government’s Legislative Agenda is appears to be as decisive as a lame-duck. Its only saving grace may be the Provincial Budget, to be presented by Finance Minister Lloyd Snelgrove on Thursday, February 24. PC leadership candidate Ted Morton. The government legislation prepared for the Spring Session (announced via media release last week) presents a mostly light agenda, including house-keeping amendments in the Livestock Industry Diversification Amendment Act, Alberta Investment Management Corporation Amendment Act, Securities Amendment Act, Rules of Court Statutes Amendment Act, Corrections Amendment Act, and the Victims of Crime Amendment Act. Bill 1: The Asia Advisory Council Act,, tabled immediately following today’s Throne Speech, proposes to create what its title suggests, a council to advise on Asian trade. A watered down Education Act is expected to be tabled during the spring sitting and debate on the Bill is not expected to be concluded until the Fall sitting, when a new PC leader/Premier will decide its fate. The most interesting piece of legislation presented by the government in this session may be the Alberta Land Stewardship Amendment Act, which the government hopes will quell dissent by rural landowners concerned that government is encroaching on their property rights. The property rights issue, spurned by the development of transmission line corridors and the passage of Bills 19, 23, 30, and 50, has drawn thousands of rural Albertans to town hall meetings over the past four years. The Liberals and NDP have tried to hone in on the issue, but the Wildrose Alliance appears to have shown some short-term success in making it one of their key political wedge issues. PC leadership candidate Doug Griffiths (right) and his wife Sue (left) with a supporter. Health care was the issue that defined the 2010 fall sitting of the Assembly which ended last November. Emergency debates, the ejection from the PC caucus of outspoken Edmonton-Meadowlark MLA Dr. Raj Sherman, the allegations of a smear campaign started by Edmonton-Rutherford MLA Fred Horne, and the forced resignation of Alberta Health Services CEO Stephen Duckett made for some of the most exciting political Albertans had seen until Premier Ed Stelmach’s resignation announcement in February 2011. 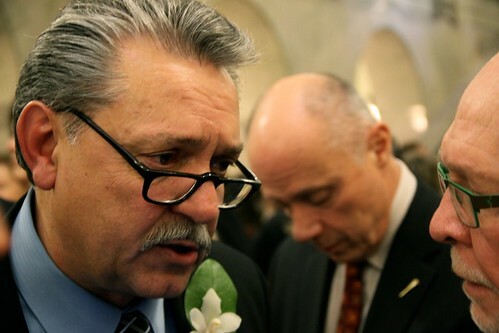 Health Minister Gene Zwozdesky will do his best to keep the health care file under control during this political season. He has started off fairly well with the announcement that the provincial budget, to be tabled on February 24, will include the promised 6% increase in health care funding. He has also deflected some criticism of the AHS Board of Directors by appointing five new members, including former Capital Health CEO Sheila Weatherill, who all seem like appropriate choices. His biggest challenge will to actually prove that patient care can be improved under his guidance. On the surface, the governing PCs will be talking about a Legislative agenda, but in reality their attention will be focused on choosing a new leader. It may be the hottest leadership contest in the province, but they are not the only party having to face the reality of a fairly fluid political environment. The Liberal Party and Alberta Party are also in the midst of their own leadership contests. Independent Edmonton-Meadowlark MLA Raj Sherman has non-chalantly mused that he may seek the leadership of a political party, but that he is not yet sure which one (Watch the video of Dr. Sherman’s interview with CHAT TV) and Edmonton-Centre MLA Laurie Blakeman defused rumours that she was crossing the floor to the Alberta Party by announcing that she will seek the leadership of the Liberal Party. With leadership contests in full-swing until Fall 2011 in three of the province’s five main political parties, Albertans may have to wait until 2012 to see another solid Legislative hit the floor of their Assembly. See more photos from today’s Speech from the Throne. This entry was posted in Alberta Politics and tagged Alison Redford, Danielle Smith, Donald Ethell, Doug Griffiths, Doug Horner, Ed Stelmach, Fred Horne, Gene Zwozdesky, Laurie Blakeman, Lloyd Snelgrove, Raj Sherman, Sheila Weatherill, Stephen Duckett, Ted Morton, Verlyn Olson on February 22, 2011 by Dave Cournoyer.